Australians enjoy a relatively high degree of life quality as judged by comparative international statistics. 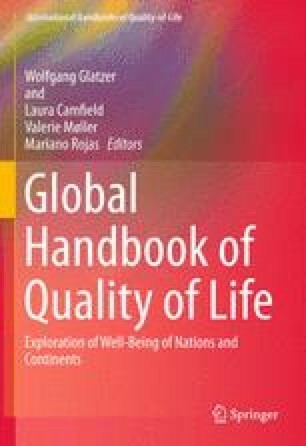 This chapter reviews the distribution of Quality of Life in Australia by considering both the objective and subjective wellbeing (SWB) of the Australian population. The review begins with an overview of objective circumstances, including income, social support, and life expectancy. It also considers the distribution of trust. Two extant measures of the subjective wellbeing of Australians are then reviewed, and it is revealed that SWB has demonstrated remarkably stable properties over the last 12 years. This chapter provides some insight into the properties of the measures and the theoretical construct of Subjective Wellbeing to explain fluctuations that occur for different components of SWB. Further, this chapter considers the demographic characteristics that are common to Australians with higher and lower SWB and offers a basis of research upon which future measures of population wellbeing can be founded. International Monetary Fund. (2011). World Economic Outlook Database, April 2012. Retrieved October 4, 2012, from http://www.imf.org/external/pubs/ft/weo/2012/01/index.htm.